Lots of rich folks migrating to CA? “Lots”? No. “Rich”? No. Another assertion is that these studies represent CURRENT migration patterns. But digging deeper, it turns out that both studies are badly outdated. The SACRAMENTO BEE study (published March, 2017) uses the interstate migration figures from 2005 through 2015. The California Legislative Analyst’s Office study (February, 2018) uses the interstate migration numbers from 2007 to 2016. But it’s more than just outdated numbers. The California state income tax rates on the wealthy changed dramatically for the worse during these time frames. In 2012, the state tax on the rich (defined as those making over $250,000 a year) went up as much as 29%. Then in 2018 with the federal $10,000 cap on deducting state and local taxes (SALT) on IRS returns, the NET tax (the after tax) cost for the wealthy went up ANOTHER 60+% — a change that is only now starting to appear in migration data (ask panicking NY state politicians about this). The two combined tax increases more than DOUBLED the income tax rate on the truly wealthy in California — an astonishing increase. By using figures that include a time when California taxes on the wealthy were FAR lower than today, these studies provided useless information. Indeed, it’s WORSE than useless. It’s fake news. Not to say that some rich people are not still coming to CA in 2019. 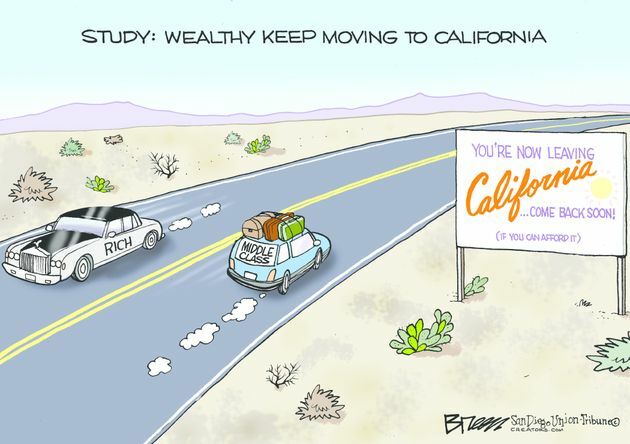 Indeed, it is theoretically possible that even after the top CA income tax brackets for the wealthy more than DOUBLED since 2011 that the same number of rich people continue to migrate annually to California today. Possible but — to put it kindly — HIGHLY improbable. Yet both these studies and the media interpretation of these studies infer that such is the case. Moreover, what these studies show is that — looking at NET domestic migration (migration between states) — LOTS of middle class and working poor are leaving the Golden State annually, while relatively few rich people are coming. The SAC BEE study’s ratio was 20,000 “rich” people moving to California (the total over an 11 year time frame) while 800,000 people making less than $75,000 moved out (net, in both cases). That’s a breathtaking 40 to 1 ratio. In addition the studies’ definition of “rich” is downright laughable. The SACRAMENTO BEE study opined that an income of about $100,000 for a family of three makes one rich in California (the median CA household income is about $58,000). $100,000? Seriously? The CA LAO study used a similar “rich” designation amount — $110,000. The conclusions by progressive pundits that the rich are flocking to California don’t stand up to routine scrutiny. California’s superb geography will dampen the enthusiasm of the rich to depart — unlike other high tax blue states such as New York. But many of the truly rich Californians who can work or live elsewhere will likely depart for income tax purposes in the next couple of years — especially if somehow Trump wins reelection. These wealthy folks will still vacation in California — perhaps keeping a posh vacation home. But as long as they can truly depart the state (there’s a number of tough tax residency criteria that must be met), it’s going to be REALLY tempting to do so after they see the results of doing their 2018 taxes. Most rich people will routinely file extensions for their complicated tax returns, getting the concrete bad news this summer. Only after this summer should we start measuring the migration patterns of the truly wealthy of California. BTW, I suspect that in recent years, most of Hollywood’s star movie actors and industry moguls have already quietly relocated their tax residences to lower tax states. After all, who makes movies in California anymore? This entry was posted on Wednesday, March 27th, 2019 at 11:21 pm and is filed under Blog Posts.